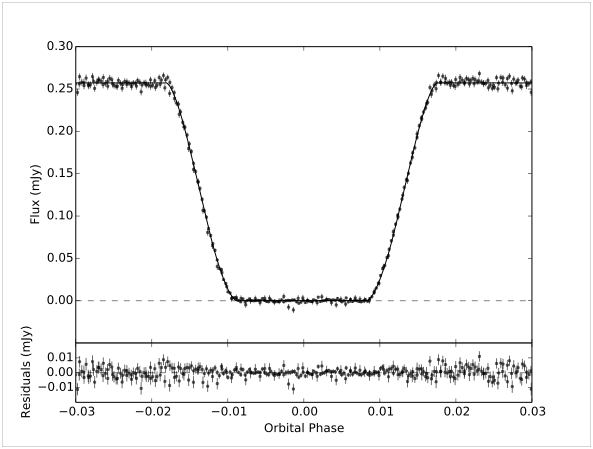 Eclipsing binaries provide a unique opportunity for astronomers; a chance to measure the masses and radii of both objects in the binary. I have a special interest in using eclipsing binaries that consist of white dwarfs and low mass stars or brown dwarfs to measure the properties of the stars. These types of binaries are useful because the cooling of the white dwarf can be used as a crude 'clock' to measure the age of the brown dwarf, which is needed to compare observations with models. The figure on the right shows an eclipse of the white dwarf by a brown dwarf. In Littlefair et al (2014) I used these observations to precisely measure the mass and radius of the brown dwarf. I also exploit a technique which uses just the eclipse light curves to measure masses of white dwarfs and donor stars in accreting white dwarf systems. This has revealed that white dwarfs in accreting binaries are more massive than single white dwarfs. Are they gaining mass through accretion, or is there another explanation? Observing eclipses of small objects requires a camera that can take high-speed data. Conventional astronomical cameras are not well optimised for this; each frame can take almost a minute to read out. Working with Prof Vik Dhillon at Sheffield, and Prof Tom Marsh at Warwick, I help to build and exploit high-speed, multi-colour CCD cameras like ULTRACAM. We are currently working on its successor, HiPERCAM, which will be faster, more efficient and collect more colours simultaneously. Studying time variable objects often means responding quickly to new events. That's why, with Vik Dhillon and Prof Richard Wilson at Durham, we constructed pt5m - a fully robotic 50cm telescope on La Palma, which is optimised for rapid response to transient events. pt5m is also excellent for monitoring known variable objects, and searching for new eclipsing binaries. The web tool I designed for submitting observations to pt5m can be found here. I am also involved in the construction of GOTO, a wide-field survey telescope on La Palma that will search for electromagnetic counterparts to gravitational-wave transients. The optical and near-infrared light from many brown dwarfs has been shown to be variable, on timescales of a few hours (see the figure below). It is believed that this variability arises from patchy dust clouds on the brown dwarf's surface, which change the brightness of the brown dwarf as they rotate in and out of view. However, it's become clear that some brown dwarfs are strong emitters of pulsed radio emission. The radio emission is caused by powerful flows of electrons, driven by the brown dwarf's rotation. Jupiter has very similar electron currents, and when the electrons hit the upper atmosphere, they produce Jupiter's aurorae. 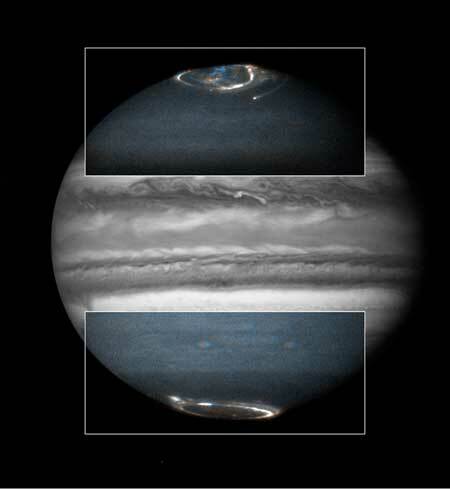 Together with Gregg Hallinan at Caltech, I am investigating the possibility that optical and infrared emission from aurorae on brown dwarfs is responsible for some of the variability currently attributed to dust clouds. This is early, as-yet-unpublished work but the results are promising. 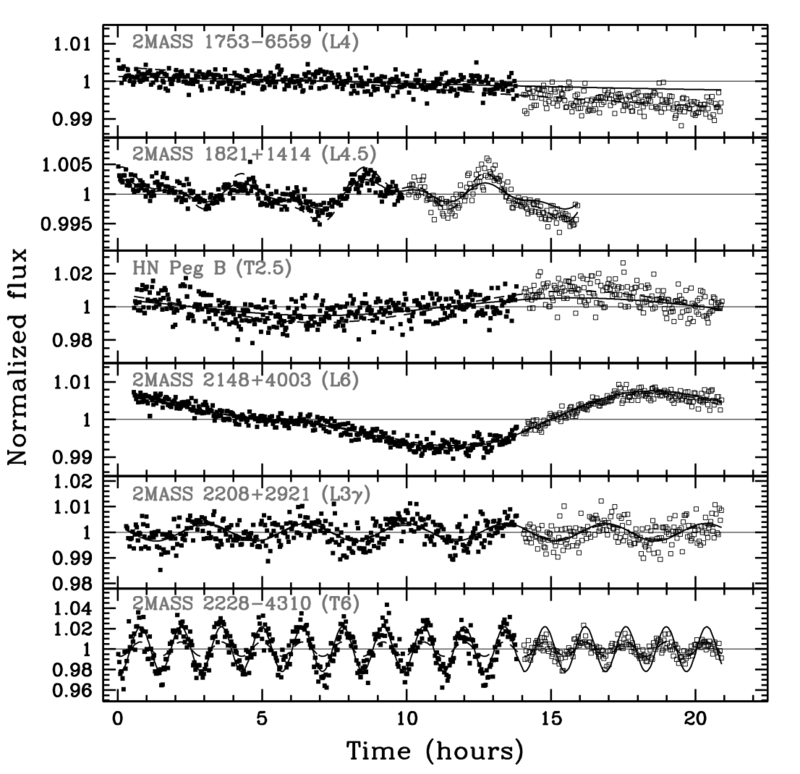 Infrared light curves of some variable brown dwarfs, taken from Metchev et al (2015).